It seems that almost every time I look on Pinterest I see something about The Little Stranger. It’s on almost every list of books that will scare the living daylights out of you. I must say that it was pretty darn scary. Waters created such a suspenseful atmosphere at Hundreds Hall. It’s very reminiscent of Henry James’s Turn of the Screw. We first glimpse Hundreds Hall in it’s hay day, as seen through the eyes of physician Dr. Faraday who’s parents worked at the Hall. Desperate to have a piece of the beauty, Faraday takes a small acorn off the bannister and carries it with him until his parents discover it. Jumping to the present, we again get a glimpse of life at Hundreds through the now adult eyes of Faraday. Hundreds Hall is no longer the beautiful building it once was. It has fallen into severe disrepair after WWII, with the family lacking funds to sustain the manor house. The paint is peeling and many of the interior rooms have been closed off. Faraday is called to the Hall to treat a young serving girl, Betty. She has recently become employed by the family and insists that there’s a strange presence in the Hall disturbing her. Faraday refuses to believe her and chalks it up to homesickness. Using this visit as a jumping off point, Faraday insinuates himself into the close knit Ayres family lives and begins to treat Roderick Ayres, the son and lord of this manor house, for injuries he sustained during the war. It takes a bit for the plot line of the story to emerge, spending quite a bit setting up the atmosphere of the tale and introducing the characters, but once the plot begins it’s a roller coaster ride. The disturbances start with Roderick who begins to feel a presence in the Hall, much like Betty. And insists he has to be there to keep it from hurting his family. In Roderick’s room small circular scorch marks begin to appear until finally his room catches fire. Faraday convinces the family that Roderick is a danger to himself and must be committed. They acquiesce and away Roderick goes. From there things just begin to crumble. Each family member is forced to face something horrible from their pasts and the consequences are tragic. It makes you wonder whether the ghosts are real or imagined. Do we create our own ghosts from leftover resentments and guilty feelings? Can these manifest themselves into something tangible? 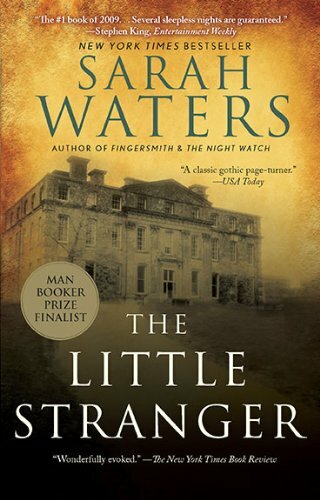 It was these wonderings that make The Little Stranger unsettling. The novel probes the psyche and sometimes what’s there is perhaps left buried. Stay tuned for the next installment of Book Battle 2015.